A goal with less than two minutes left to play by defenceman Nicolai Bryhnisveen sealed a hard fought 5-3 win for the Genting Casino Coventry Blaze over the Manchester Storm at the Skydome Arena. 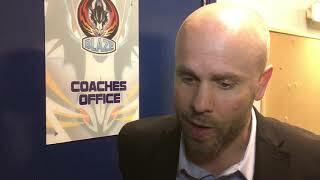 After losing to the Storm 5-2 in Altrincham on Saturday night, the Blaze were still without long-term absentees Ross Venus and Miika Wiikman for the return fixture, while the Storm gave a start to netminder Jindrich Pacl. The first period saw both teams create good scoring chances and really came to life when Blaze captain Kevin Morris and the Storm's Harrison Ruopp dropped the gloves at centre ice at 7.19. Both men received five minutes for fighting. The Storm then thought they had opened the scoring when Riley Stadel put the puck in the net only for the goal to be washed off by referee Stefan Hogarth, and the first period ended scoreless. Just over two minutes into the second period it was the Blaze’s turn to think they had taken the lead when GB international Luke Ferrara appeared to poke the puck home, only for the goal to be wiped off after a review. But the deadlock was finally broken at 24.04 when defenceman Justin Hache found the back of the net with a big shot from the blue line on a power play. The Blaze then doubled their lead just over three minutes later when Tim Crowder finished off a great passing move at 27.23. However, the Blaze’s two-goal lead lasted just 17 seconds before the Storm pulled one back through Dallas Ehrhardt at 27.40. And following a spell of Blaze pressure the Storm tied things up at 32.31 with a goal from Ciaran Long. But with the second period winding down the Blaze retook the lead. With a pile of bodies in the Blaze crease following a Storm attack, Coventry broke out and made it 3-2 through Ben Lake at 38.22. 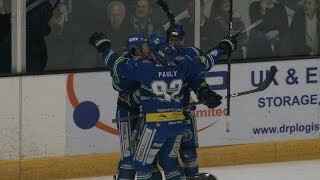 With both teams searching for the win, it was the Blaze who scored first in the third period. After successfully killing a penalty, Coventry made it 4-2 through Ferrara at 50.42. But the Storm struck back less than three minutes later, cutting the deficit back to one with a power play goal from Luke Moffatt at 53.04. However, with the Storm applying pressure and looking for an equaliser, the Blaze’s Norwegian defenceman Bryhnisveen finally secured the win at 58.09 with a bullet of a slap shot from the blue line.